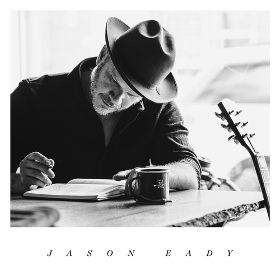 If you like your country music straight with no frills, and with a heavy dose of Texas-inspired songwriting, there’s few who can match Jason Eady. Announced on Thursday (1-26), he will be releasing his sixth overall album on April 21st presented under his own name. It will be his first record in over three years, and will be released on Old Guitar Records via Thirty Tigers. The 10-track album was produced by longtime collaborator Kevin Welch at Blueroom Studios in Nashville. It will feature backing vocals by Vince Gill on a song called “No Genie in This Bottle,” as well as instrumental contributions from noted musicians Lloyd Maines on steel guitar, and the SteelDrivers’ Tammy Rogers on fiddle. Also lending to the album is Jason Eady’s wife and regular singing partner, Courtney Patton. Expect a mostly acoustic sound from this self-titled release, with the only plug-in instrument being Lloyd Maines’ steel guitar. “At the beginning I told everyone I wanted to make a record where, if the power went out, we could still sit down and play all the songs the exact same way,” says Eady. Thematically the album touches on parts of Eady’s personal life, like nearing the halfway pole on “40 Years.” “I’ve always been drawn to writing that’s got a simplicity to it, where you’re digging deep into real day-to-day life,” he says. Jason Eady recently released a duet album with Courtney Patton called Something Together. I can’t wait for this to be releaed. I just got Something Together in the mail yesterday and I’m confident it’ll be in the running when your Albums Of The Year are listed in December. Way over due. I’m really excited about this album. Jason is one of the most overlooked musicians in traditional country. Hope this gets his name up their with Simpson, Stapleton, and Jinks. I completely agree. I popped on Daylight and Dark the other day for the first time in a long time and thought, “why have I not been listening to this?? ?” Looking forward to the new one! Probably the most played artist in my collection. I will credit Jason Eady being the one to make me a country fan. He knows how to capture emotion in a song and deliver it accurately. I don’t listen to him to be entertained, I listen to him because I can feel like I am a part of it somehow. He draws you in. Cannot wait! The versions circulating on YouTube of “No Genie” and “Why I Left Atlanta” indicate this should be a 2017 album of the year contender. Probably my most anticipated album this year. Pretty good timing for him to release this, I think if its promoted properly, it should make some noise in the industry. I don’t think he’ll take off like a rocket but i can see this being a very successful release for him.But than again, I think he’s completely happy with where he is with his career. Eady is the real deal, from his songwriting down to his band, this is great news. Not sure if you know or not, but if I download the duets album from her website, can I play it on iTunes even though it’s not for sale in iTunes? Awesome! Thanks for the reply. I think Jason is great, I will be getting this album. But I have to admit I really like his wife , Courtney Patton’s songwriting better, like the many articles you mentioned women being overlooked, she deserves a lot more accolades. Anything they do together feels real and meaningful. Thanks for spotlighting this. I can’t wait for this release. I like Lloyd Maines on the steel guitar. This promises to be an Album of the Year candidate. I can’t wait for this! I just discovered him a few months ago and I can’t get enough! Now this guy can write. It’s great that Gill signed on, too. Stars past their prime (as stars) still have plenty of pull.